YouthBuild student James at last year’s MLK Day of Service Project, where YouthBuild Philly students and staff painted murals at Morton Elementary. On Martin Luther King Day, former high school dropouts will lead a project to repaint the interior of McMichael Elementary School in Mantua. 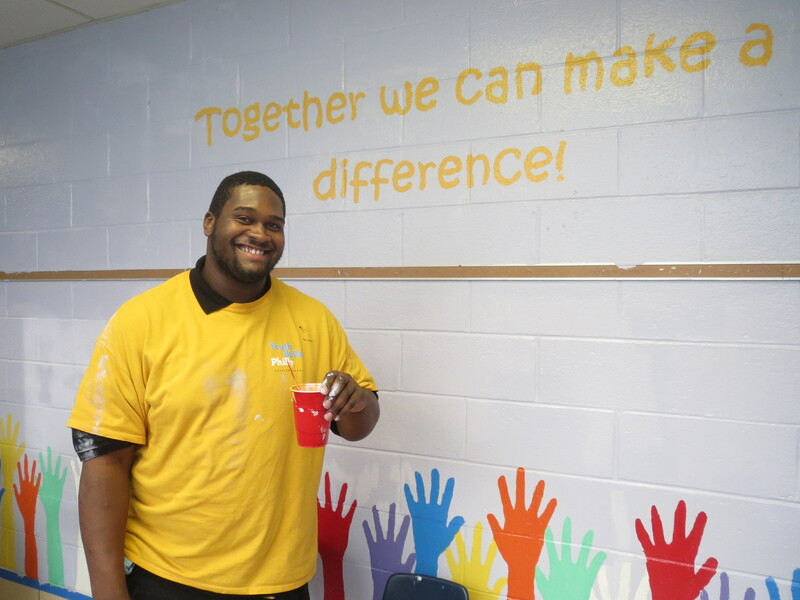 Philadelphia, PA – Jan 15, 2015– More than 250 students, staff and volunteers from YouthBuild Philadelphia Charter School will repaint classrooms, hallways and community spaces at Morton McMichael Elementary on Monday, January 19 to honor the vision and legacy of Dr. Martin Luther King, Jr..
McMichael Elementary, a K-8 school that serves approximately 400 students, is located in the heart of Mantua and is considered a major community asset in the redeveloping neighborhood. Volunteers from YouthBuild Philly will spend the morning of January 19 repainting hallways and stairwells inside the elementary school. Students and staff from YouthBuild Philly will be joined by community volunteers from Starbucks and DMi Partners.